​or a basket+support fitted for just £35!! ﻿Work in town and fed up with the traffic in the mornings and at hometime? Enjoy shopping in town but don't like trying to find a parking space? Want to get fitter and healthier but can't find the time? Travel smart! Build exercise into your day by cycling into town! Commuters - Worried about a change of clothes? We have lockers for spare outfits and a WC room that's big enough to change in! Nowhere to carry your essentials? Take advantage of our luggage-carrying options! Shoppers - Worried you won't be able to carry all your shopping on a bike? No problem! Our panniers and baskets will carry a lot more than you think! Thinking this will cost a lot? 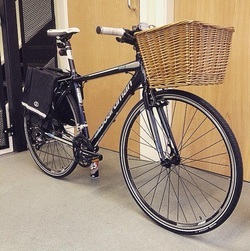 Save up to 20% this month and get panniers and a rack fitted for just £50 or a basket and support fitted for just £35!! Worried about the cost of parking your bike and using the lockers? Don't be! It's a bargain £1!! That's right, just £1 a day for one or both facilities!! 2018 - make it the year you get out on your bike more. Let the Cycle Hub help you make more of your bike and make your bike work for you!